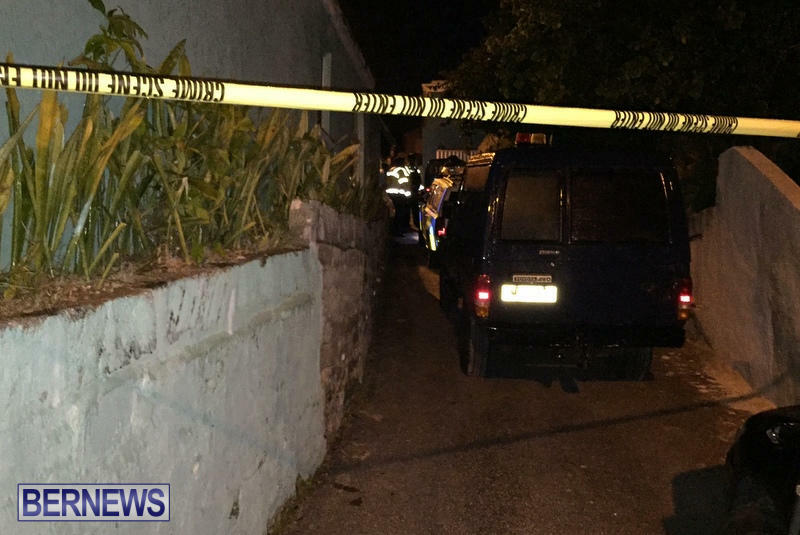 [Updated] Police have confirmed that a 26 year old man was shot tonight [May 21] in the area of Crossland Lane in Pembroke. His condition is unknown at this time. Police Media Manager Dwayne Caines said: “At 10.45pm Saturday night [May 21st, 2016], police attended a report of a firearms incident that took place at Crossland Lane in Pembroke. “Early information indicates that a 27 year old Pembroke man was shot and subsequently was transported by private vehicle to the hospital. “The scene has been cordoned off and a full investigation into the incident is now underway . Update 1.17am: Police have amended the injured shooting victim’s age to a 26 year old man. Update 2.00am: Police have now confirmed the 26 year old shooting victim has died as a result of his injures. Anyone who may have any information on this shooting is to contact the Serious Crime Unit on 295-0011 or the confidential Crime Stoppers hotline on 800 8477. Update May 22, 2.49pm: A police spokesperson said, “The Bermuda Police Service extends condolences to the family and friends of 26 year old Patrick Dill, who was shot in the Crossland Lane, Pembroke area around 10:45pm Saturday May 21st and later, succumbed to his injuries at King Edward VII Memorial Hospital. “Mr. Dill was initially thought to be 27 years of age. His death marks the first gun murder of 2016. A Family Liaison Officer has been assigned to assist the Dill family at this difficult time.